We are excited to be celebrating 70 years of the MSAA and happy to share this website with you. Here you’ll find information about members who are auction professionals who can assist you with all your auction needs. They conduct auctions of various assets including: estate, collection, agriculture and construction equipment, vehicle, real estate, farm, liquidation and more. We hope you enjoy exploring the site. Founded in 1949, the MSAA has a proud history that is made up of dedicated members from all facets of the Auction Industry. Today we educate our members on current Auction Techniques and best Practices, industry wide. This three day event features over a dozen educational seminars and many other activities intended to encourage networking opportunities among the membership. Have worldwide exposure with your listing in the MSAA online membership directory. In the summer of each year the association hosts a one day “summer picnic” which includes two educational seminars, a noon picnic lunch and generally a networking opportunity in the afternoon. Published three times a year, the Auctioneer is the official magazine of the association and feature informative, educational articles which assist in keeping the membership abreast of developing trends within the industry as well as association news and activities. Do I hear two? ?Identical twins Jim and Dave McLaughlin’s close relationshipstarted long before they entered the industry, and it has carriedright on through more than three decades of selling. Read the entire article here. 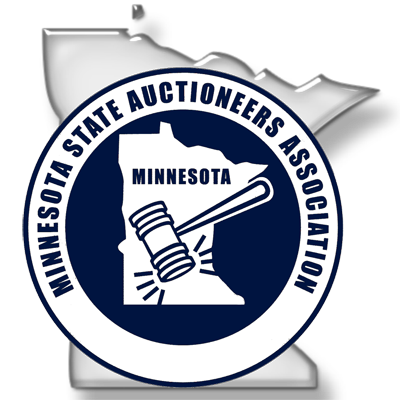 The Minnesota State Auctioneers Association is an organization of licensed auctioneers. With the support of its membership, the association works to promote the auction profession.